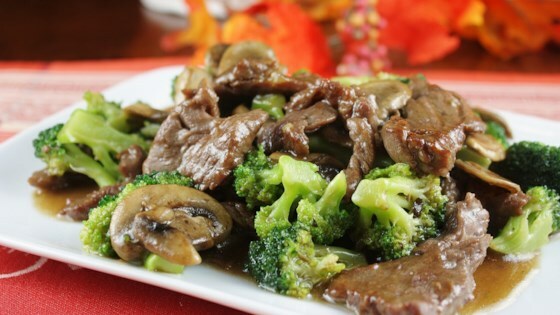 "Tangy and spicy beef and broccoli are a winning combination in this quick stir-fry dinner." Cut beef across grain into thin slices. Combine 1 Tbsp. each cornstarch and soy sauce with garlic and sugar in medium bowl; stir in beef. Let stand 10 minutes. Meanwhile, remove flowerets from broccoli; cut into bite-size pieces. Peel stalks; cut diagonally into thin slices. Combine 1 cup water, remaining 2 Tbsp. soy sauce, 4 teaspoons cornstarch and crushed red pepper in small bowl. Set aside. Heat 1 Tbsp. oil in hot wok or large skillet over high heat. Add beef and stir-fry 1 minute; remove. Heat remaining 2 Tbsp. oil in same pan. Add broccoli and onion; stir-fry 2 minutes. Sprinkle 1 Tbsp. water over vegetables; cover and cook 2 minutes, stirring occasionally. Add beef and soy sauce mixture; cook and stir until sauce boils and thickens. Remove from heat; stir in vinegar. See how easy it is to make this classic Chinese takeout dish at home. This recipe is fool-proof, and very tasty. I felt it was better then most good restaurants.